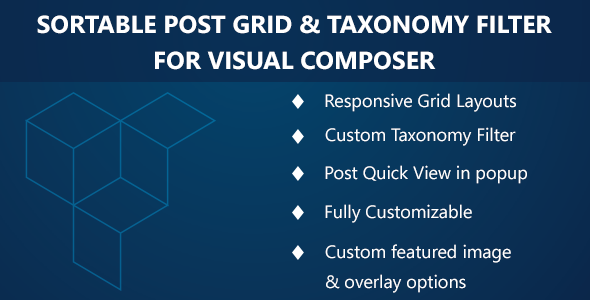 The authors of this amazing addon(BrainstormForce) calls it: ``All In One Plugin for Your Visual Composer Needs!``. 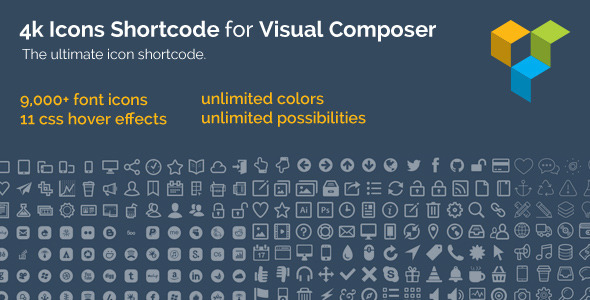 I already used Visual Composer, 2 years now and feel that the standalone package comes with less shortcodes than I expect. What's the solution here? After making a research I found out the ``Ultimate Addons`` extension. I just purchased it and its amazing. Why? It comes with many extra shortcodes like: Interactive Banners, Flip Boxes, Info Banners, Info Circle and many other. If you want to see by yourself this plugin, you can give it a try by checking the demo. 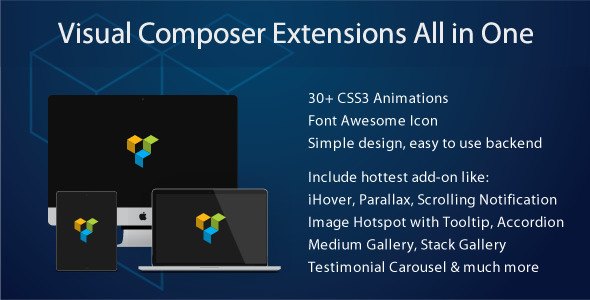 Visual Composer Extensions is yet another stylist and versatile addon for Visual Composer. The number of sales of this plugin makes you check it and see what can do. 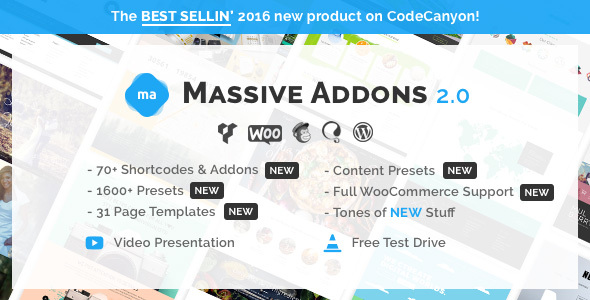 With +7694 sales on CodeCanyon this addon gives unlimited ways to improve your WordPress experience by providing a huge list of shortcodes. Few of them are: Google Maps Plus and Charts, Gallery shortcodes, Audio and Video, WooCommerce Products Ticker, Products Slider, Timeline or Modal shortcodes. The cool fact with this plugin is that it offers Test Drive to see if you like it and make a good choice by purchasing it. With over 5538 sales, this addon is actually a bundle of addons! How cool is that? I think this is amazing news for every WordPress user. This addon covers 55 elements, $200+ value which makes you save a lot of money and turn your site into a unique piece of art. Easy Tables will be your Table Manager. All you have to do is to install it and start build tables. 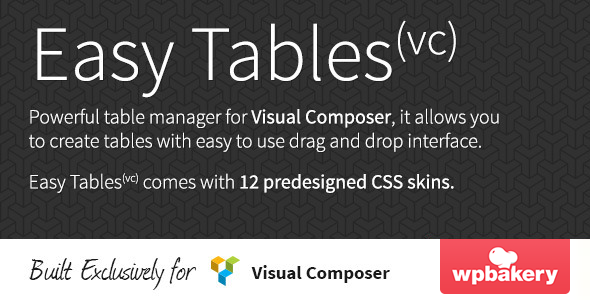 Powerful table manager for Visual Composer allows you to create and manage tables with drag and drop interface. Working with your tables will be very familiar “Excel” like experience. 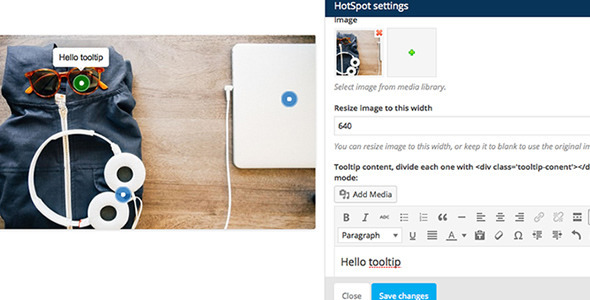 Working with tables never been easier on your site. Add, Remove rows or columns in bulk(saves your time). WYSIWYG toolbar with essentials controls – right at your finger prints. No more boring tables, take full control over your data and presentation! Yes, you see corectly, this extension gives you unlimited ways to build Parallax Backgrounds and Videos with few clicks only. Usually, parallax backgrounds are slow. 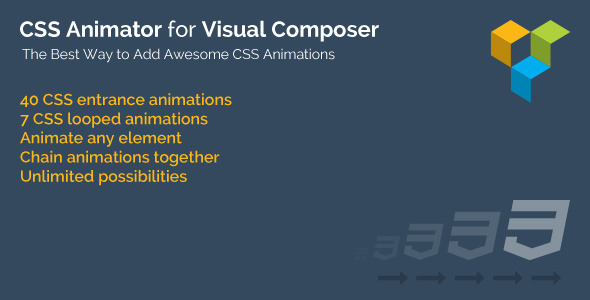 But using ``Video & Parallax Backgrounds For Visual Composer``, hardware accelerated effects were added to make your site fast and snappy. 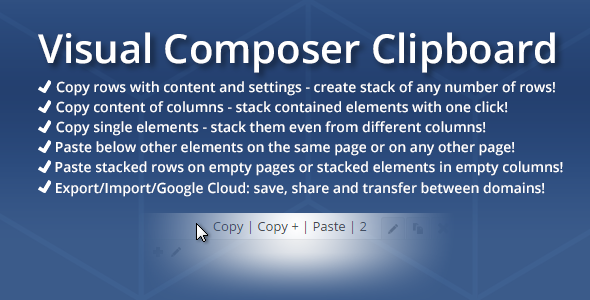 With ``Easy Form`` your can create and manage forms very easily within Visual Composer directly. Literally within minutes you can build complex forms as Booking form or just a simple Contact form or Login/Register form form with drag and drop form element without touching a single line of code. You can customize your WordPress wp-login.php, it allows you can build WP login/register page. See demo for more details. Indeed Smart PopUp comes with Predefined Template for Opt-In and Standard Popup. With more than 100 features, you can create so many types of popups. The Smart PopUp plugin has a key feature, the targeted audition. Don’t display the popup for everybody and anytime, be smart and pick your audience. Out of the “Load Page Popups” you can set the popups on exit page or when the user clicks on a button. Also, FaceBook and Google Maps popups are now available. Basically you can ``Carousel Anything`` with this plugin. It is Flexible, Responsive, Touch, Fast and Clean. 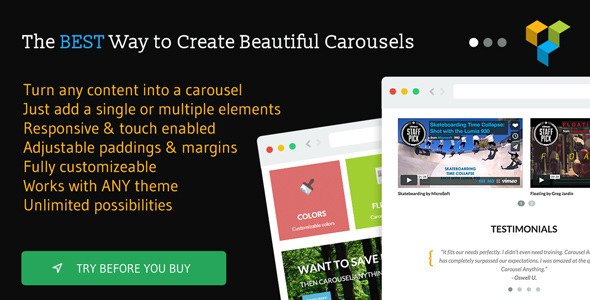 With Carousel Anything you can create carousels out of anything. You are in control of your contents and the looks of your carousel. Create single image carousels, feature boxes like the above example, team members, or even testimonials. There’re no limits. Scroll down to see more examples. Modal box is a simple CSS3 & jQuery effect that allows you to overlay a small element over a website. The most important benefit of modal box is that, it avoids the need to use traditional window pop-ups or page reloads. Let it be your Newsletter opt-ins, shortcodes, images, videos, contact forms or social media widgets. 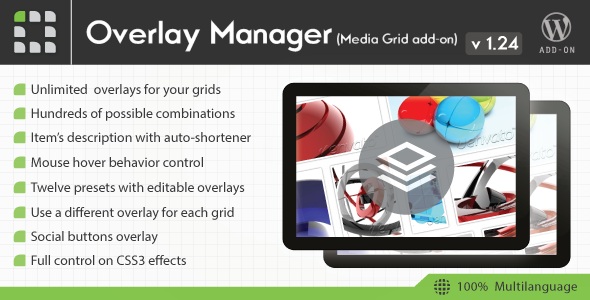 ``Media Grid - Overlay Manager add-on`` does just what its name suggests: Gives you the possibility to create and manage unlimited overlays! Many elements to mix, unlimited colors, hundreds of different possible combinations. Full size layers, split ones, icons, shapes, corner layers, crossing layers, angular slices, buttons, textual blocks, image effects. Everything has been created to set your creativity free to create what you like most: from hover behaviors, to CSS3 animations and easings! 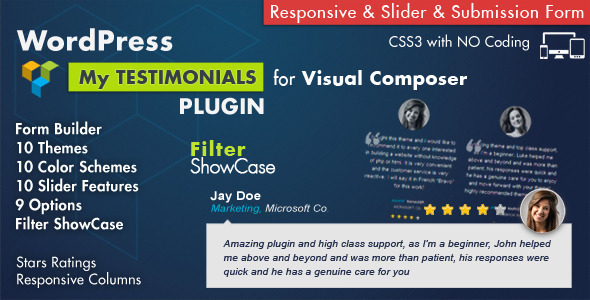 Testimonials Showcase for Visual Composer is the best well made and up to date Plugin built to display testimonials and reviews using V.C. Page Builder. 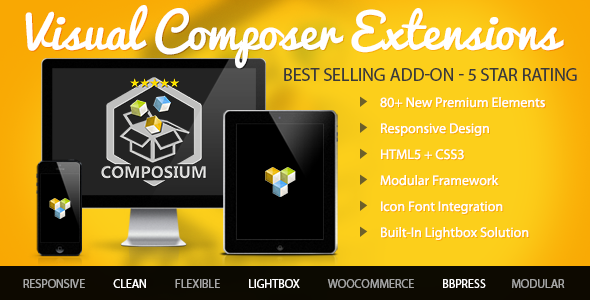 It is Fully Visual Composer Compatible; comes with 10 Predefined Responsive Themes. This plugin also comes with submission forms where your visitors cam submit their own Testimonial. Personally I like this plugin because it has a lot of good reviews on codecanyon and also a lot of sales(+1100). 4k icons is a Visual Composer shortcode add-on that gives you the awesome ability to use over 9,000 font icons in your WordPress site. You can add background shapes to your icons, adjust the size and colors, apply different hover effects, and align them to suit your every need. 4k Icons was built to have all the icons you would ever want and need. We have a lot of social icons which you can turn into links. We even have all the US states as icons just in case you need them. With Fast Gallery anyone can build fast and easy multiple types of galleries to use with Visual Composer or without it, as shortcodes. You can add Pagination, Lazy Load, It comes with Photoswipe lightbox. By default the plugin comes with 8 different types of gallery(PrettyPhoto, Photobox, Magnific Popup and many other); It also comes with 12 hover styles; custom colors. One of the best layouts is masonry. Team Showcase for Visual Composer is the best well made and up to date Plugin built to create unlimited Teams with special design and multiple options. 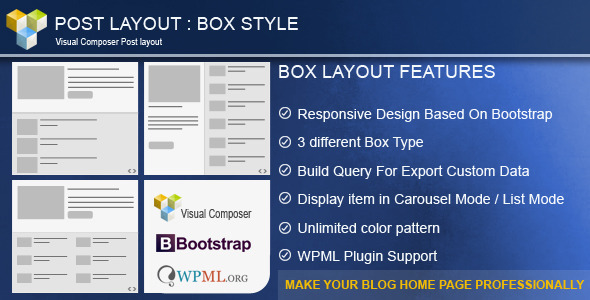 This plugin comes with multiple layouts, slider compatible. 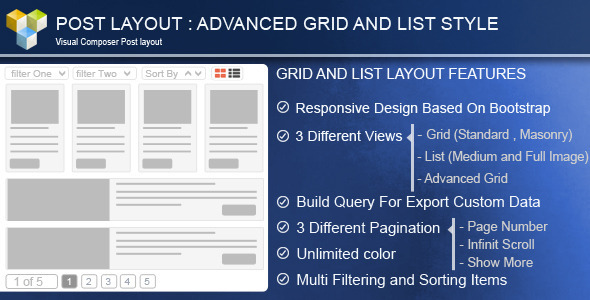 You can also build members grid using filters and sorting filters. With ``Icon Box`` your website will be animated using icons shortcodes styled in multiple manners. With help from Visual Composer you can use this plugin with icon collections such as Font Awesome. The plugin comes with Icon search functionality for easy set up. Creative backgrounds do truly set the tone for your website. So we offer you easy tools that will help you utilize them quickly. One of the best features is the Fixed Image Background which keeps the image fixed at it’s position while the other content moves on scroll. Few more features are Vertical & Horizontal Parallax, Hover Parallax, Video Background, Multilayer Hover Parallax. 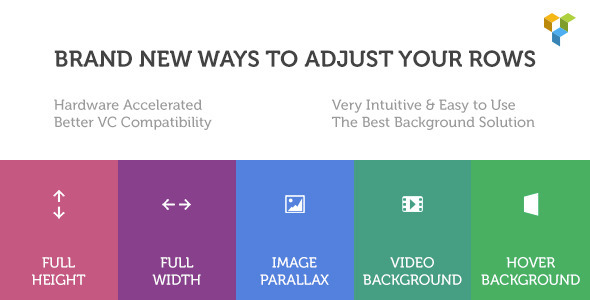 If you are going to add parallax sections in your website you should give this plugin a try for only $11. 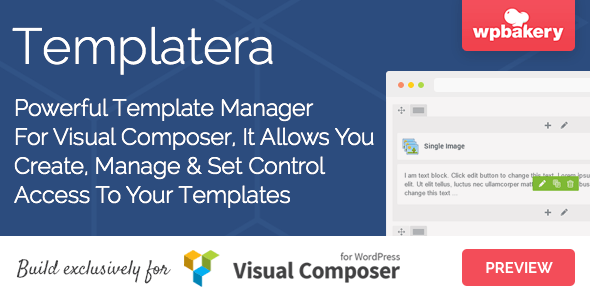 Are you searching or a enhanced tool to build Elegant Tabs within your Visual Composer Page Builder? Well, I have a solution for your. It lets you add any shortcode in multiple tabs so that users get to choose the data they want to see. We have also added numerous possibilities of customization where you can select different colors, icons, backgrounds for different sections/tabs. The content area can be filled up with TinyMCE editor; which means you can implement WYSIWYG. 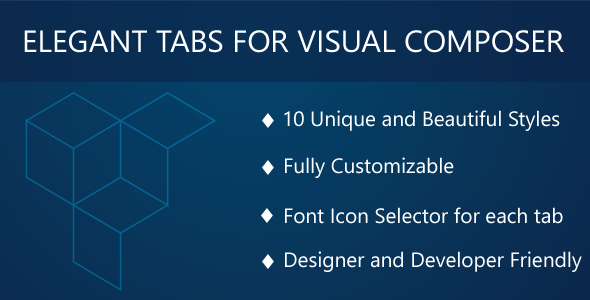 Now if you have any other suggestion to improve this amazing list of add-ons for Visual Composer, feel free to leave a comment in the section below. You can also spread the word by sharing this article on Facebook, Twitter or any other Social Media.